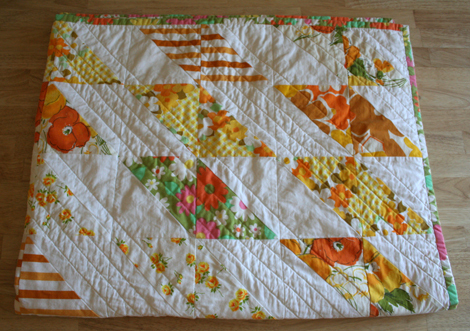 I completed my vintage quilt over the weekend and I'm tickled pink with how it turned out. This quilt is made entirely of thrifted cotton sheets on the front and the back. The batting and thread are the only items that I purchased new for this quilt. Haven't quite wrapped my mind around how one would thrift those items. I was planning on stippling this quilt but after basting it I went in a different direction. I quilted with lines to play up the diamond shapes in the pattern. Painter's tape was used as a guide and it was quilted it in the following pattern: quilted 1 line then leave a space, quilt 3 lines then skipped a section, and back to quilting 1 line. If you look at the back of the quilt you can see the quilted pattern a bit clearer. The quilt is by no means the queen size in the original design. The final measurements are 56" x 45", a perfect lap quilt size. The B-meister is currently trying to convince me to give him the quilt. So far I'm undecided only because I have some fabulous Amy Schimler fabrics that are going to become a quilt for his bed sometime this summer. Then again, can a child ever have too many quilts? One more photo only because clothing lines by a lake only make quilts look prettier. Beautiful job!! 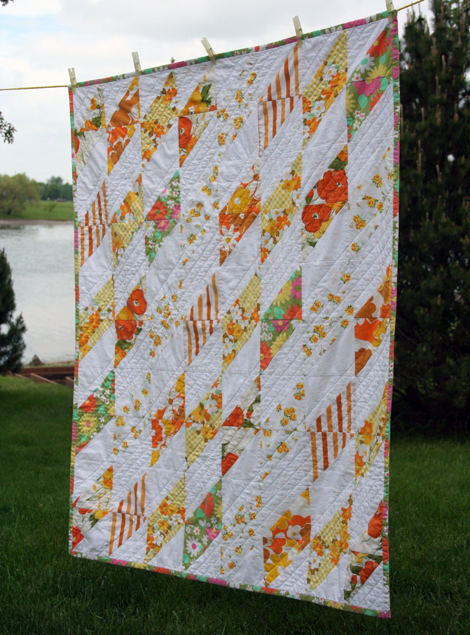 The quilting lines really make the quilt look fabulous! You have inspired me to actually start my quilt with thrifted fabrics. This is gorgeous! Well done. :) I really need to try quilting in lines. Looks fantastic. its gorgeous...i often use thrifted poly fleece and polyester duvets...continental quilts as my filling if am going all out for authentic thrifted. Sometimes manage to find the thread too but have to watch out for moths having eaten the old cotton on the wooden cotton reels! Love it! I've been looking for inspiration to use my vintage sheets with. Its lovely! This is so gorgeous. I love it! Someday I will make a quilt like this too. I don't know how you do all the crafty things you do with 4 little ones around all the time. I love how your quilt turned out ... the fact that you were thrifting it is very cool. Especially love that you didn't match the stripes!! what a beautiful quilt, it is so summery and yummy. send pix when you make your next quilt if you use my fabrics... looking forward to seeing what you make. Sew, sew, sew darling! Love it! thank you and you will have to share progress photos of your quilt along the way. I highly recommend painter's tape if you are looking for somewhat straight and even. Of course a quilt with wonky lines would be loads of fun too! the ideas you listed are great options, now I'm going to have to keep my eyes open when thrifting. thank you tons and for visiting. Oh thanks so much. I highly recommend this pattern as well. Quilts and More, spring 2009. Funny, I always think I never seem to get enough done in my day. When you have made your quilt I want to see it!! Thank you for the encouragement and for your design. Great job to you! I can't wait to see the next one you come up with. thank you for kind words :) I'll be sure to stop by your blog. Hey there! 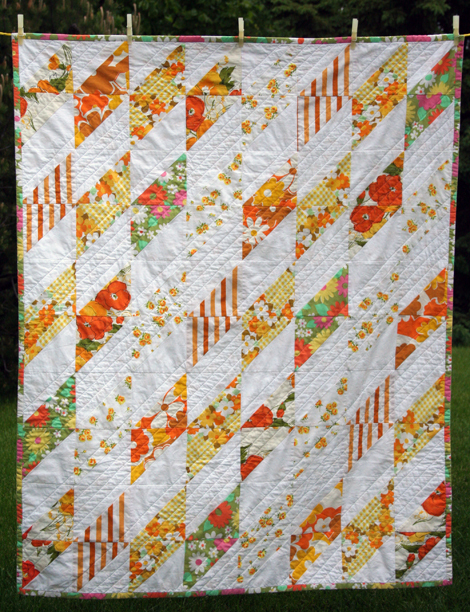 Love the way you quilted this, and I do love the fabric, just gorgeous. what a gorgeous quilt! i just love it! i've used masking tape to mark quilting lines before and it works like a dream! 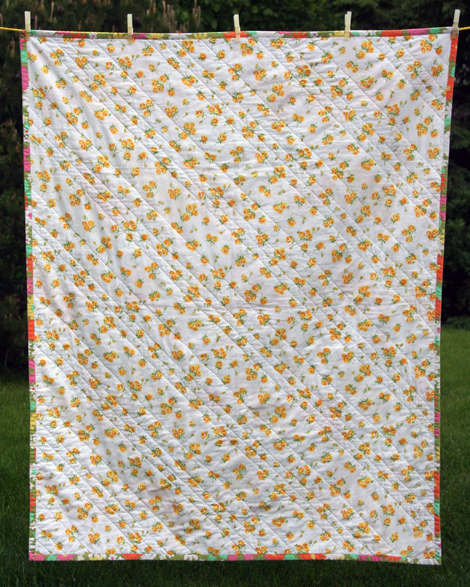 i've been wanting to make a vintage sheets quilt and this looks like a fun pattern. Beautiful!!!! tres beaux! 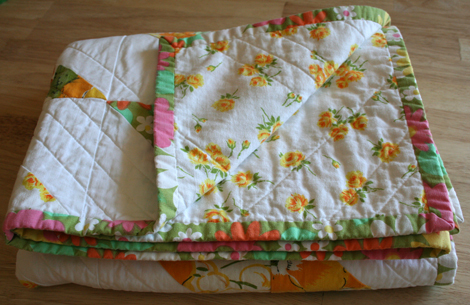 Strangely enough in mid May I was also making a quilt from vintage linens...just a baby quilt 4 Elousia - the vintage linen inspiration must be in the air. I'm very much a novice in the quilting arts. also i have to say - i had one the same linen prints (not in my baby quilt) - the one you used for your bias tape - love it! I used it all up making doll cloths and a skirt i never wore! what an amazing quilt! I see this quilt desing before (at the magazine) and i want to try make one... your did a great job! i hope make one such fantastic like yours! I consider myself a novice in the quilting arts as well and as such I thought starting with vintage linens would be a good place. It's good to know I'm not alone. I love that one print so much, it is totally reminiscent of the sheets my mum had growing up in the 70's. Who would have thought I'd love it so much now. It was one of my favorite finds at the thrift store. I love it! I have a growing collection of vintage bedlinen, and I'm bookmarking this for when I get "enough". Oh, what a lovely way to use your vintage sheets! I have a thing for vintage sheets - love this idea. I need to add your blog to my reader so I don't miss any of your inspiring projects! I love the movement of the lines - I thought you had done some fancy work with diamonds but looks like half-square triangles. Brilliant! Sorry to get back to you so very late, but I did want to say thanks so much! This post is killing me ! 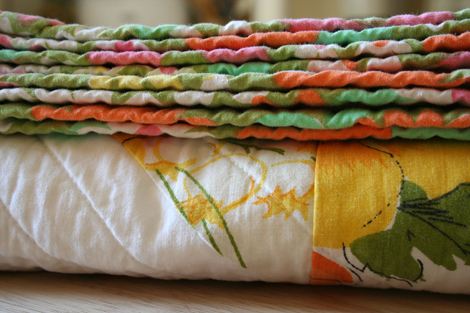 I've seen other blogs that use thrift sheets/ linens and they , like yours , are GORGEOUS !!!! when I go thrifting , I find NO VINTAGE SHEETS and LINENS !! just ugly linens ! thanks for the inspiration ! I love your quilt !!!! LOVE IT !!! I plan on finding linens at garage sales this spring and summer !!! Thank you :) and I wish you much luck in your vintage linen search. I'm sure you'll turn up something but in case you don't, I have a tons of vintage linens in my etsy shop. Just check out the "shop" link at the top of blog under my header.